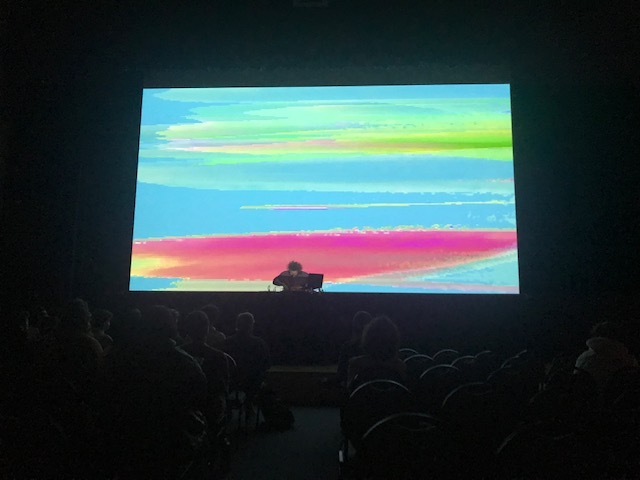 Monday, April 1, experimental musician Tyondai Braxton gave a live performance in Commonwealth Auditorium. Braxton is this year’s Class of 1939 Maurine Stuart Dulin Artist-in-Residence for the music department. Braxton was a founding member of experimental rock group, Battles, which he left in 2010 after touring-plans conflicted with Braxton’s commitments as a solo artist. While Braxton was with Battles, the band gained critical acclaim for their 2007 album, “Mirrored.” Braxton is a graduate of the Hartt School of performing arts within the University of Hartford in Connecticut, where he studied composition. Braxton visited the College last semester and held a synthesizer workshop for music students as part of the modular synthesis contemporary music theory course. The artist-in-residence fund rotates among the departments of music, English, art and art history, theater, speech, and dance. This year the music department is splitting the fund between Braxton and Dr. Ysaye Barnwell, a prolific African-American composer and former member of acclaimed a cappella group Sweet Honey in the Rock. Braxton was invited to the College of William and Mary and to the artist-in-residency position by music professor and musician, David Dominique. Dominique was already familiar with Braxton’s work and thought that he would be the perfect guest for the College’s music students. After a short introduction by Dominique, Braxton wordlessly entered the stage to the lone table of gears and began. A low hum filled the auditorium, growing louder and wavering until it morphed into warbling whistles and thumping bass. Soon, the music was accompanied by surreal, electronic visuals projected on the massive screen on stage, engulfing Braxton behind the synthesizer. For the next 45 minutes, Braxton took the audience on a journey through a surreal, electronic soundscape. Audience members attended the performance for a variety of reasons and came away with a multitude of conclusions. “I appreciate that a lot of time and effort went into it, but I guess I don’t understand it, and my ears hurt a little,” Christopher Lee ’21 said. “The best way I could put it is that the last music thing I listened to was the Mitski concert in here, and I feel like this was a bit of the complete opposite,” Cody Hammock ’20 said. Both Hammock and Lee had been brought to the performance by their friend Finn Mayhew ’21. Several music students in attendance commented on the importance of Braxton’s work not only for themselves but for the College community. These sentiments were echoed by Dominique. “We’re here in Williamsburg, and there aren’t necessarily a ton of opportunities to see avant garde music or adventurous music … so I think it’s really good for the students to get exposure to a world class artist that’s been living in Brooklyn for many years,” Dominique said. Afterwards, several audience members stayed behind for a chance to speak to Braxton, who welcomed people to come on stage and get a close look at his synthesizer board. Braxton explained that the visuals playing during the show were created in collaboration with his wife, Grace Villamil, a visual artist. He took a moment to express how the visuals interacted with his live performance of the music. Braxton hoped that the audience enjoyed and found meaning in his performance. Next articleQ: Why should I file a care report? What process does it initiate?